There is something deeply satisfying about bottling your own preserves. Somehow it relates to that inner instinct to store food for the winter or capture the essence of warmer times to bring out for a bit of colour on those dark winter days. And so it is with chutneys. Once you’ve made your own chutney, there’s no going back to those too-sticky or too-vinegary shop-bought varieties. They also make fabulous home-made Christmas gifts – so what are you waiting for? Chutneys are very versatile in that they can be made with almost any fruit you have to hand and are a great accompaniment with many dishes such as crusty bread and cheese, savoury bites, sausage rolls or samosas, as well as hot and cold meats. The jars you use must be scrupulously cleaned using hot, soapy water and then sterilised in a hot oven for 5-10 minutes to ensure no bacteria can affect the produce. Pour in the chutney whilst the jar is still hot and seal securely. This is a wonderful sweet chutney which is delicious served with cheese. For best results, allow to mature for at least a month to develop the tangy flavours. Take your largest mixing bowl and add together 450g of peeled, cored and chopped dessert apples, the same of dried mixed fruit, the grated rind of a lemon, and quarter to a half teaspoon each of cinnamon, nutmeg, ginger and mixed spice. Then mix in 350g soft brown sugar and 425ml cider vinegar. Stir over a low heat for about 45 minutes until the mixture is reduced, thick and sticky. Take off the heat and mix in 4 tbsp of brandy, then ladle into jars. Pears go equally well with savoury or sweet dishes but at Christmas, are particularly good with cold cuts of ham, goose and duck. Simmer together the zest of a lemon, 350g sugar, a tsp juniper berries, a tsp of mixed peppercorns and allspice (sometimes called pepper berries), a few cloves and 275ml of cider vinegar. Then add 5 tbsp honey. Meanwhile, peel 6-8 firm Comice or Conference pears, depending on their size, core, and dip in lemon juice to stop discolouration. Then, when the sugar is completely dissolved, add to the pan. Simmer the pears, making sure that they don’t bob to the surface of the syrup, until tender (20-30 minutes). 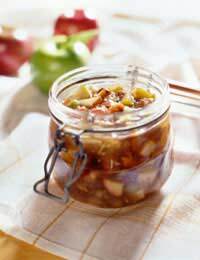 Then remove the pears to the jar and boil the residue rapidly for a further 5 minutes before pouring over the pears. If desired, add a stick of cinnamon to the jar. Finely chop or whiz up in a food processor, 150g each of raisins, dates and dried apricots along with 2 apples, 2 onions and aprox 50g of fresh root ginger and place in a pan. If you like your chutney hot, you can add some ‘oomph’ by putting some crushed red chillies in a muslin bag, tying securely (so that you can retrieve them later) and popping in the pan along with the rest of the ingredients. Then pour in 300ml water and stir over a low heat for 15 minutes. Add 150g sugar, 25g salt and 600ml cider vinegar. Continue to stir over the heat until the mixture is thick. Remove the chillies if used, and pour into jars. If you wish to present your chutneys as gifts, shop around for pretty jars or use classic preserving containers, then cover the lid with some festive fabric, attach labels, a card, possibly even a spoon and tie with ribbon or raffia.